This section describes how HTML is related to SVG, which an XML-based vector image language that can be embedded in HTML document to provide static or animated graphics. 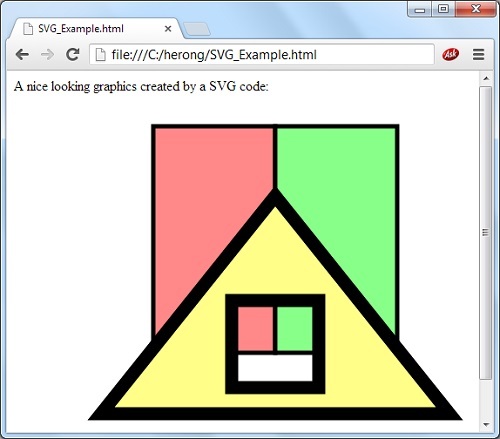 SVG (Scalable Vector Graphics) is an XML-based vector image language that can be embedded in HTML document to provide static or animated graphics. Here is a good example of an HTML document with embedded SVG graphics from http://srufaculty.sru.edu/david.dailey/svg/intro/svg_intro.htm. <path d="M 160,280 160,20 300,20 300,280 z"
<path d="M 440,280 440,20 300,20 300,280 z"
M 250,320 250,220 350,220 350,320 z" fill="#ff8"